Have a safe and happy Halloween! Please remember, don't drink and fly and watch out for the munchkins. You can also add sunflower seeds, Craisins and/or a bag of mallow pumpkin/candy corn mix. Warning, if you like sweet/salty mixes this is kind of like candy crack. 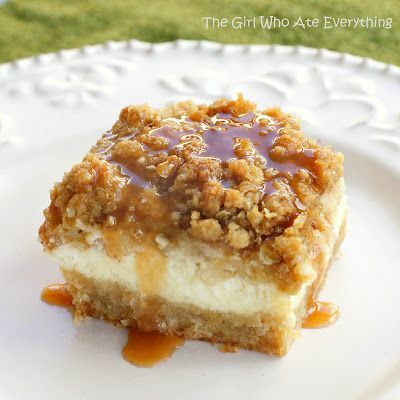 For dessert I made another easy recipe that was lurking on my Pinterest page, Apple Streusel Cheesecake Bars from The Girl-Who-Ate-Everything.com and this was a crowd pleaser. I have to admit her photo looks way more appetizing than mine and I do want you to know how great these are so I'm "borrowing" Christy's. In a medium bowl, combine flour and brown sugar. Cut in butter with a pastry blender or 2 forks until mixture is crumbly. Press evenly into a 9x13 baking pan lined with heavy-duty aluminum foil. Bake 15 minutes or until lightly browned. In a large bowl, beat cream cheese with 3/4 cup sugar in an electric mixer at medium speed until smooth. Add eggs, 1 at a time, and vanilla. Stir to combine. Pour over warm crust. For the streusel topping: In a small bowl, combine all ingredients. 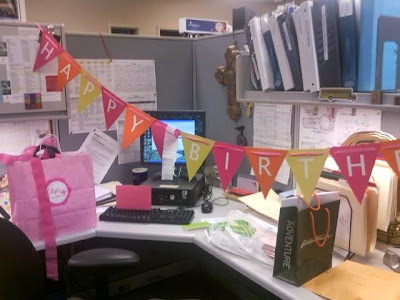 Finally, this is what was waiting for me at my desk Monday. What a nice surprise! Now if I could only celebrate without actually having to add another year to my age that would be great. Although I take comfort from one of my friends reminder that I'm actually only one day older. I am so happy I like in a part of the country that experiences four seasons. Yesterday was a perfect fall day and, as DH went to the Chief's game with friends from work, I took the opportunity to drive and walk around a bit and enjoy the height of fall color. 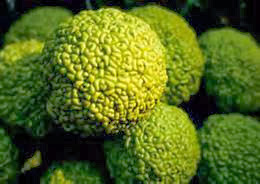 I was glad to come upon this hedge apple (also called Osage Orange) tree in a nearby park and collect several of the lumpy fruits. Do you have these in your area? They are supposed to repel spiders but I like them because they have a wonderful spicy smell and collected several to keep in my craft room to enjoy over the winter. I've also seen them painted white like snowballs and loved that idea too. Enjoy this beautiful season! 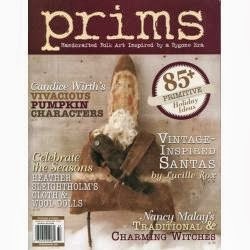 I picked up the latest issue of prims yesterday at Barnes & Noble. It is filled with awesome fall and winter characters and I can't wait to sit down with a cup of hot tea and enjoy the stories behind the creations. I always enjoy learning more about the folks whose blogs I visit from time to time, including Old Lady Morgan and Audry Eclectic Folk Art. Here are a couple of pieces from our entry way table. I don't have anything very elaborate going on there but enjoy seeing these old friends every day. The JOL lantern is a reproduction but I don't recall if it is Bethany Lowe or not. The cat and pumpkin toy are BL pieces. I like their nostalgic look. This is book fair season! Due to the generosity of those who attended 2012 Christmas Eve services at our church every student at our six partner schools can select two free books at their book fair. These are schools that, for the most part, have not been able to support a book fair for years. I've had the privilege of visiting every fair and seeing the joy of the kids and hearing about their enthusiasm for reading--I can tell you the Diary of a Wimpy Kid series is in big demand! Some of them pick out books they can read to their younger siblings--so sweet! Happy October! I'm long overdue for an update but just haven't been doing anything too exciting. Just a lot of work and trying to keep up at home. 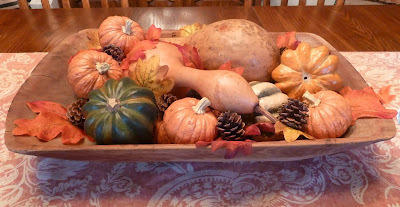 I couldn't let fall go by without doing a little bit of decorating. It's nothing like I used to do when the guys (and me) were younger, but enough to give the flavor of fall around the house. So yep, life is good, enjoying the fall and trying to keep Kiska out of trouble.